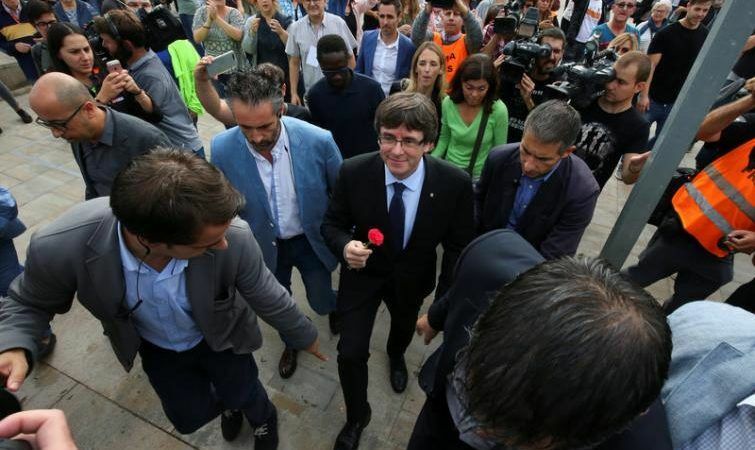 Catalonia’s leader, Carles Puigdemont, said the region won the right to break away from Spain, with his government claiming on Monday (2 October) that 90% of voters backed independence in a banned referendum marred by violent clashes. He urged the European Union to stop looking “the other way” following the police crackdown. “We are European citizens and our rights and freedoms are being violated,” Puigdemont said. But the leaders of the EU institutions remained silent. From the leaders of the EU countries, only Belgian PM Charles Michel and his Slovenian colleague Miro Cerar broke ranks, calling for political dialogue. In a press briefing, regional government spokesman Jordi Turull said 2.02 million Catalans voted for independence, during a 42.3% turnout. A further 2% cast a blank vote, he added, and 0.5% of ballots were void. Spanish Prime Minister Mariano Rajoy declared the Sunday plebiscite had been blocked, saying “today there has not been a self-determination referendum in Catalonia”, a region deeply divided over independence. Further adding to tensions, unions and Catalan associations called a region-wide strike for Tuesday (3 October) due to “the grave violation of rights and freedoms”, urging people to take to the streets in Catalonia, a major engine for Spanish growth. At least 92 people were confirmed injured out of a total of 844 who needed medical attention, Catalan authorities said, as police cracked down on a vote Spain’s central government branded a “farce”. The interior ministry said 33 police required treatment as a result of the clashes. The violence raised alarm abroad and further heightened tensions between Rajoy’s government and the authorities in Catalonia in the worst political crisis in Spain in decades. Rajoy called the vote a process that “only served to sow division, push citizens to confrontation and the streets to revolt”, but left the door potentially open to negotiations on greater autonomy for the region. The referendum was organised under the threat of reprisals and criminal charges but thousands of Catalans stood in defiance of the central government crying “Votarem” – “We will vote”. From early in the day, helmeted police armed with batons moved in en masse to seal off polling stations and seize ballot boxes, sparking clashes. Videos posted on social media showed police dragging voters from polling stations by their hair, throwing people down stairs and attacking Catalan firefighters who were protecting polling stations. “They took the ballot boxes by force… and they literally yanked them from us as we continued to sing ‘Els Segadors’, the Catalan hymn, and shouting ‘long live democracy’,” said Marc Carrasco, in charge at one Barcelona polling station. But the regional government said Puigdemont had managed to vote anyway in nearby Cornella del Terri. 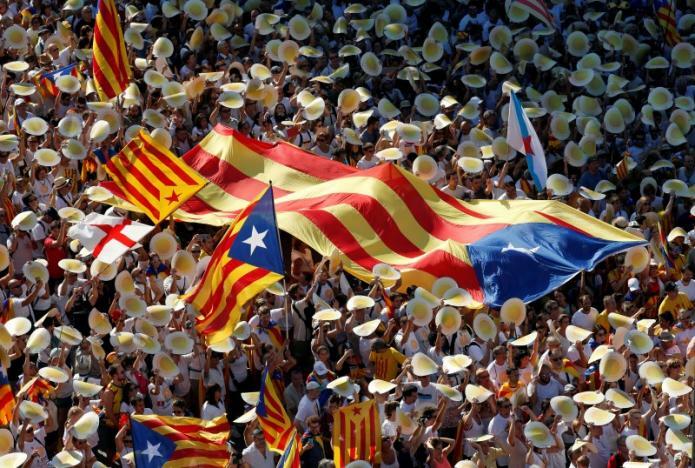 The crackdown drew a sharp rebuke from Catalan leaders and others including Nicola Sturgeon, leader of the pro-independence Scottish National Party. The events in Catalonia are watched closely in Scotland, which voted overwhelmingly to stay in the European Union in last year’s referendum on EU membership. Scottish First Minister Nicola Sturgeon says Scotland should have a right to vote again once the terms of a Brexit deal become clear. Under a sea of umbrellas outside a school in Barcelona, a crowd gathered, among them elderly people in wheelchairs, families with buggies and parents clutching toddlers by the hand. “I’ve voted! I’ve voted,” one man shouted. “That’s the great hope, to be able to vote freely like this despite the problems we’ve faced, I’m very happy. I can die peacefully,” added Jose Mas Ribas, 79. Although Catalonia already has significant control over education, healthcare and welfare, the region says it pays more in taxes than it receives from Madrid. This has sparked resentment which has been further exacerbated by Spain’s economic woes and helped push the secessionist cause. News reports about referendum in Catalonia whereby Catalonia sought to separate as a nation from Spain has taken place on 1 October 2017 amid some violent incidents. Spain Govt looks to be viewing the voting as illegal while over 90% Catalans are claimed to have voted for split. At the same time , news reports about referendum whereby Kurdish voted for separation from Iraq have come. These developments look to be corresponding , in substance , to the alerts of 16 May 2017 of this Vedic astrology writer through article – “ Is world War III around the corner ?” – published in summer 2017 issue of The Astrologer’s Notebook from North Port , Florida. While alerting that August – September in 2017 ( which could extend to 10 October 2017) look to be of major worrisome concern for vulnerable countries and regions across the globe covering , among other things , the following matters or concerns : – “ Unions and associations of nations or regions may develop some serious issues having potential to cause fissures , which could give rise to good cause for some member or members or regions to ‘LEAVE’ or become not supportive to the aspirations of such nation or association”. It seems the alert was indicative and meaningful. The only way forward and out of the trap Rajoy has sent Spain in is a Spain-wide constitutional reform for a federal constitution. By drowning the Catalan issue into a broader questioning, it would deflate immediate concerns about what share of regional wealth is supposedly sent in excess to Madrid. Low resource regions as well as Catalonia would have their say, and by putting an end to its over-centralised 1978 constitution a Spain would end up with pacified relationships between regions conscious of what solidarity and resources mutualisation is about, instead of having the feeling of ever sending too much to the central government. There is a need in Spain to restore country-wide cohesion. This cannot be achieved by force.